The Edifier e30 Spinnaker Bluetooth Speaker System comprises a pair of almost tusk/Viking-horn shaped speakers and very a cool wireless remote control. Although, tusks or horns are what immediately spring to mind; as the name implies, the speakers are modeled on, and named after, a yacht’s spinnaker sail. 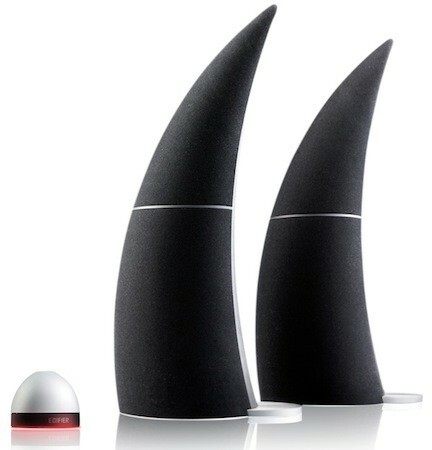 According to Edifier, the sail inspired design enhances sound. With the tapered cylindrical shape, internal standing waves are reduced to immeasurable levels, and the aluminum frame and internal damping materials reduce unwanted internal vibration. Each speaker weighs in at about 3.5lbs and stands over 16-inches tall. The product exudes quality from the minute the box is opened. Each speaker comes wrapped in a cloth bag, and at 3.5lbs each, they feel like a quality pieces. The dome shaped remote control is probably the coolest controller I’ve seen since the iPod’s wheel. The weight, illumination and brushed metal finish really give it a quality feel and it feels great in the hand. Had I not known in advance, after seeing, feeling and hearing the speakers, I would have guessed at a price tag approaching $1,000. In fact, the speakers wouldn’t look overdressed sporting a Bang and Olufsen logo. 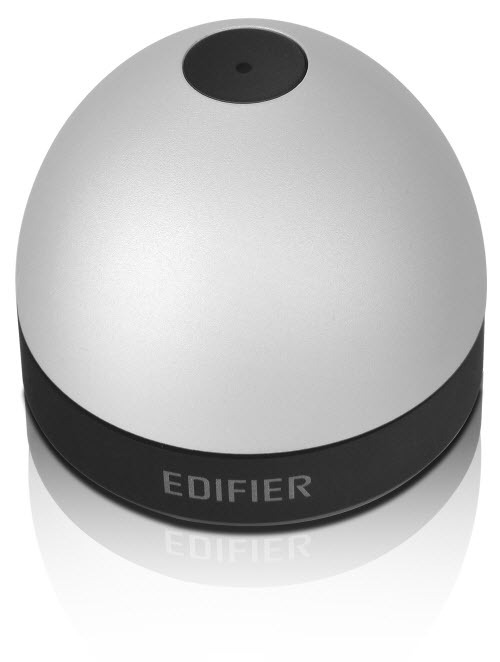 Happily, the speakers can be yours for just $350 direct from Edifier. The base of one of the speakers houses several connections and the second, just an input from the first speaker. Wireless connection can be made from virtually any Bluetooth-equipped (2.1+ EDR) device. The remote contains a single micro USB connection for charging. An initial charge of two hours is recommended. 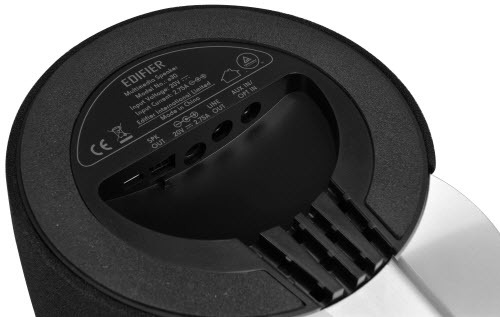 The main speaker contains a small (not too distracting) LED at the tip, which glows red, green or blue to indicate the active connection. After an initial charge of the remote, the first thing I did was to dig out my old Airport Express and connect it to the speakers via optical cable. I fired up my iTunes, selected the Edifier speakers and spun some tunes. The sound was impressive: clear highs and mids, with a tight deep bass. The tri-amping clearly shone through over traditional crossovers. The sound quality easily matched that from my Sonos S5 with the added benefit of a stereo imaging, Bluetooth connectivity an and optical input. Even Dr Dre’s “Still D.R.E” with its deep bass notes didn’t tax it. Pleased with the AirPlay performance, it was time to give Bluetooth a bash. My iPhone 4S connected to it without any hesitation and within a few seconds I was spinning tunes from my iPhone via Bluetooth. Sound quality was as good as it was from the Airport Express. Finally, I connected the speakers to my laptop (via optical) for completeness. My lossless rip of Pink Floyd’s Dark Side of the Moon sounded wonderful. When a Bluetooth connection is present, a press and hold disconnects the Bluetooth and reverts to the Aux/Optical input. When no Bluetooth connection is present, the same action puts the device into standby. Pressing the top and rotating the body performs skip/prev for Bluetooth devices. The only minor negative I could find is that it uses a proprietary cable to interconnect the two speakers, so the maximum distance between the speakers is limited to the length of this cable (about 4 feet). If you’re looking for a great looking, great sounding set of speakers with the flexibility of wired or Bluetooth connectivity, look no further. At $350, they’re a steal and will add a touch of elegance to any setting.